Links to this page can be found in Book 6, Day 4, View C6 and Rione Campo Marzio. 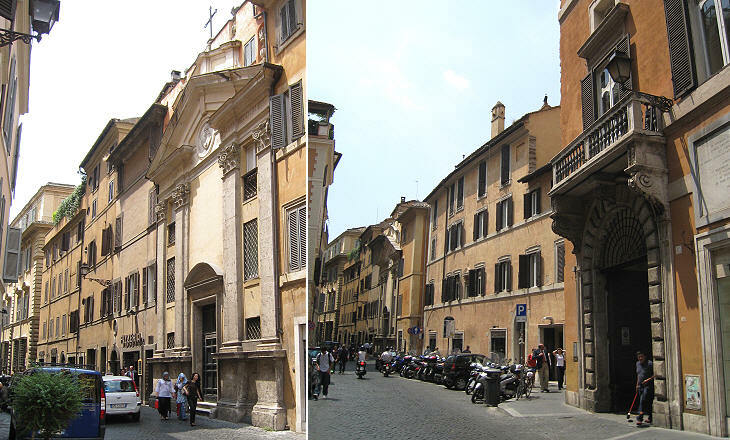 Several churches of Rome were dedicated to St. Nicholas, bishop of Myra in the IVth century; they were distinguished by the addition of a reference to their location (in Arcione, in Carcere) or to their owners (dei Lorenesi, dei Cesarini). The small parish church in Campo Marzio which Vasi depicted in a 1756 etching was named after some houses which belonged to the Perfetti or Prefetti; this medieval family is better known as Vico or di Vico; they had their power basis north of Rome, on the slopes of Monte Cimino, where a small lake is called Lago di Vico. In the XIIth century the Vico managed to be appointed Praefectus Urbi on a hereditary basis; at that time this position controlled the trade of basic commodities and bread-making and it was very lucrative. In the government system of Ancient Rome praefecti ("makers in front/on behalf") were magistrates and officers whose power came from an act of delegation; during the Republic they had minor importance because the holders of all the main positions were elected. Emperor Augustus gave large powers to Praefectus Urbi; the authority of this position was increased by his successors and when the emperors ceased to reside in Rome the Praefectus Urbi became the de facto Governor of Rome. The view is taken from the green dot in the small 1748 map here below. 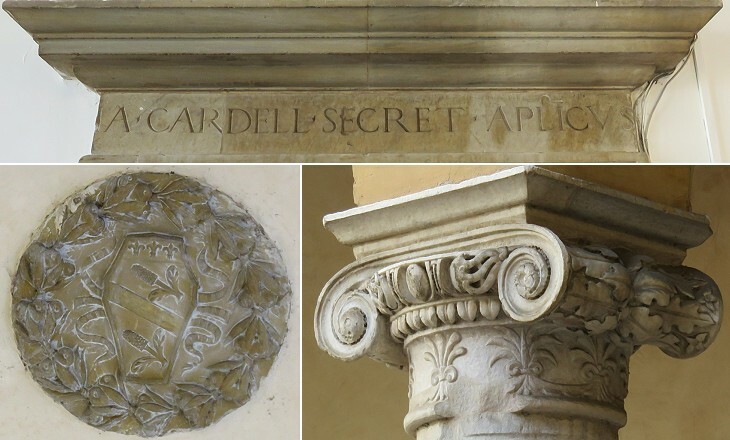 In the description below the plate Vasi made reference to: 1) Palazzo Pallavicini; 2) S. Niccolò; 3) Palazzo Medici; 4) Street leading to the church of SS. 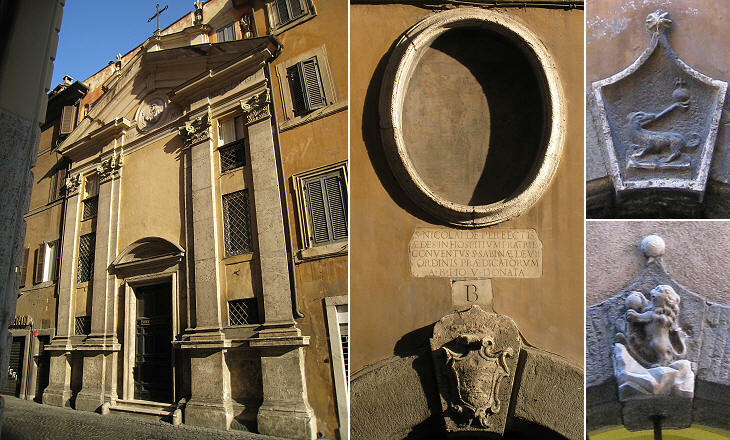 Biagio e Cecilia (today called Madonna del Divino Amore); 5) Palazzo Conobili. 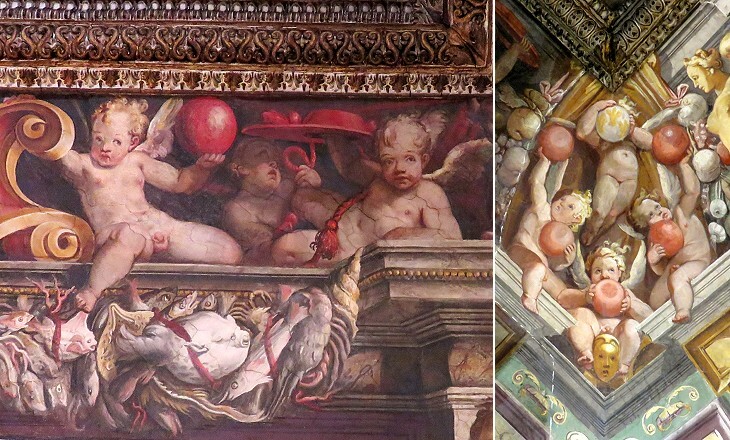 Most of the buildings have maintained their XVIIIth century appearance; the fresco over the portal of the church is lost and a storey was added to Palazzo Medici. 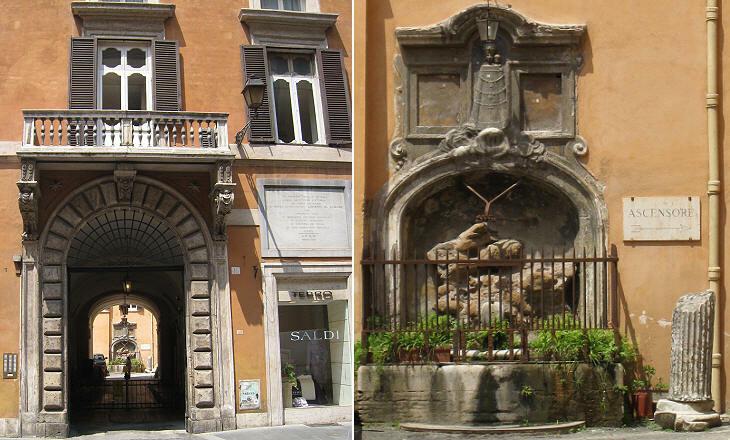 Via dei Prefetti is at the edge of the main shopping district of Rome which is centred in Via Condotti. Nr. 444 in the small map near Palazzo Medici indicates Teatro della Pallacorda (aka Teatro Metastasio), a small theatre which replaced a court for real tennis (pallacorda). It does not exist any longer. The earliest records about the church go back to the VIIIth century when Rome was still a province of the Byzantine Empire and many churches were dedicated to Greek saints. 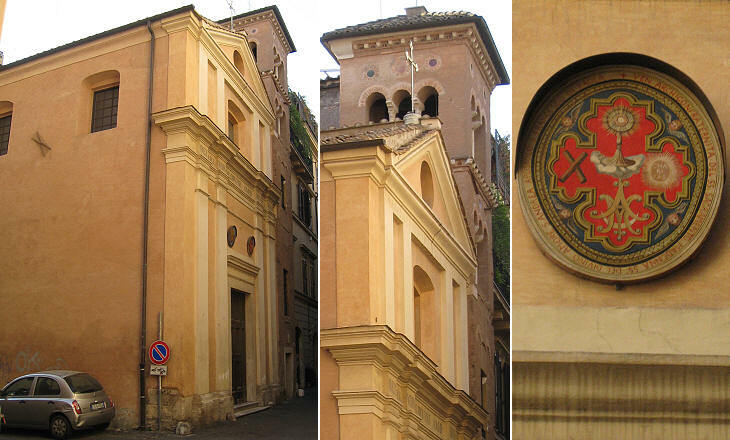 The current church is mainly the result of a series of modifications made in the XVIIth (façade) and XIXth (interior) centuries; the small circular relief in the pediment shows Pope Pius V.
In 1824 S. Nicola dei Perfetti ceased to be a parish church and in 1848 it was assigned to a brotherhood which in 1860 undertook the redesign and decoration of the interior. This was completed at the end of the century at the initiative of Cardinal Francesco di Paola Cassetta whose parents are buried in the church. 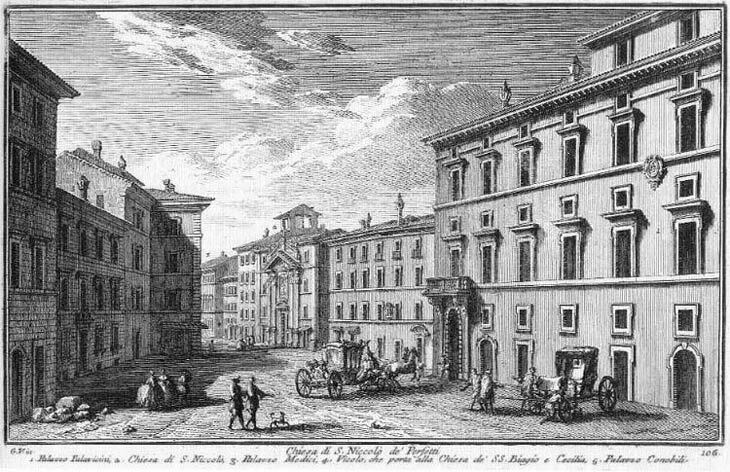 Today a reference to Palazzo Pallavicini usually indicates Palazzo Pallavicini Rospigliosi, because the building shown in this plate is generally called Palazzo dei Piceni (not to be confused with a palace by the same name in Rione Parione). The Pallavicini already owned the palace in 1551 and they probably modified it before 1645 when Gerolama Pallavicini bequeathed it to Confraternita della S. Casa di Loreto. This is the town where the angels carried the house of Nazareth where Mary received the Annunciation. The inhabitants of the region surrounding Loreto are known as Marchigiani after Marche, the official name of the region; Picenum is an ancient name of the southern part of the region. Opposite Palazzo Pallavicini the building which Vasi calls Palazzo Conobili underwent a thorough XIXth century restyling and is void of interest. The area where Palazzo Medici was built initially belonged to the Cardelli who lived nearby; the property was bought in 1550 by Pope Julius III for his brother Balduino; the existing buildings were modified by Bartolomeo Ammannati who separated the frontal part of the palace from the garden by designing a courtyard decorated by an elegant inner façade. Ammannati was involved also in the design of the Pope's villa. The palace was confiscated by Pope Paul IV, Pope Julius III's successor, on the grounds that it had been acquired and modified by using public money. Pius IV, the following pope, was on friendly terms with Cosimo the then Duke of Florence; the Ciocchi Del Monte, the heirs of Pope Julius III, who were of Tuscan origin, appealed to him to obtain the restitution of their confiscated properties. Cosimo brokered an agreement with Pope Pius IV and in recognition of his services he obtained this palace, which was since called Palazzo Medici or di Fiorenza. Cardinal Ferdinando, son of Cosimo, was one of the members of the Medici family who resided in the palace. 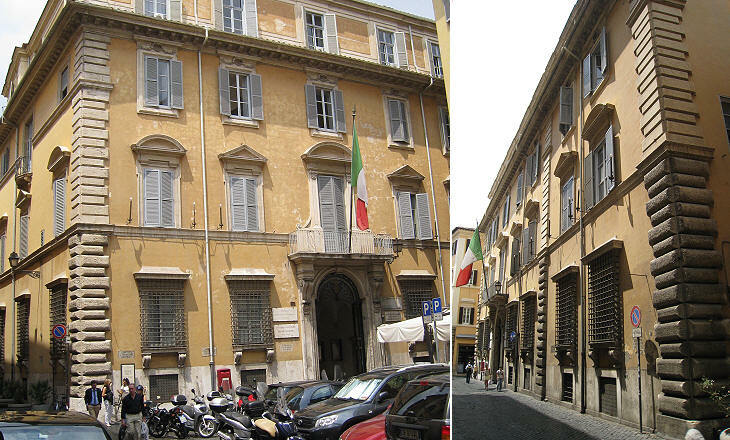 In 1755 the Embassy of the Grand Duchy of Tuscany which was situated at Palazzo Madama was moved to this building. After 1870 it was acquired by the Italian State. Today it houses Società Dante Alighieri, a body founded in 1893 to promote the knowledge of the Italian language abroad (you may wish to see their website - it opens in another window). 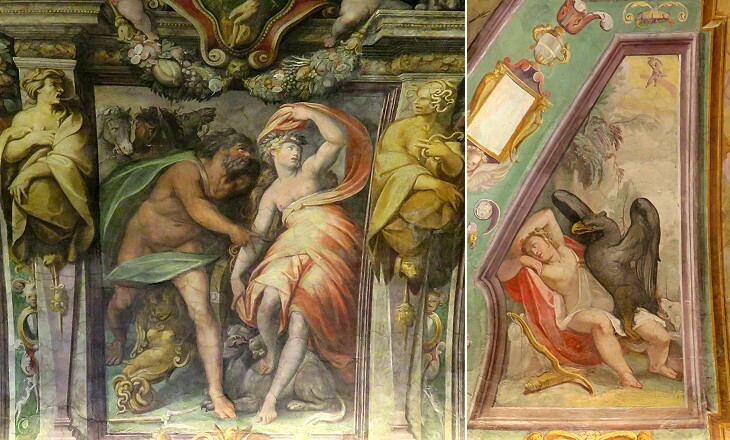 The palace retains part of its XVIth century decoration and in particular the frescoed ceilings of two rooms of the apartment of Cardinal Ferdinando de' Medici, who lived in the building until 1587 when he became Grand Duke of Tuscany. You may wish to see his study room at Villa Medici which also was decorated by Jacopo Zucchi. 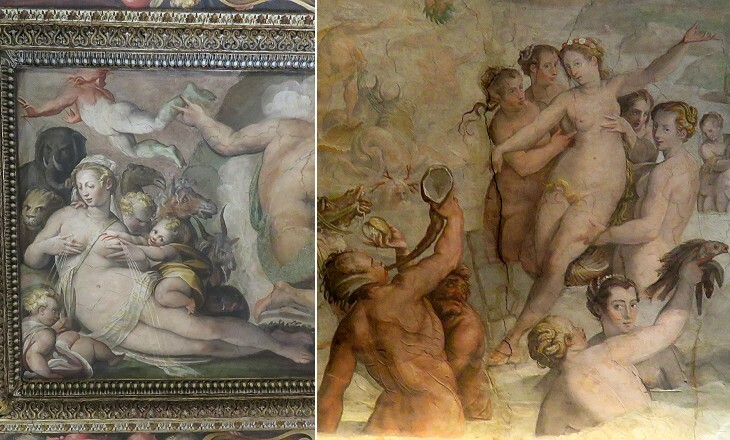 The frescoes were meant to represent the Four Seasons and the Four Elements (Earth, Water, Air and Fire). This was done through the depiction of pagan myths having references to them e.g. Ganymede and Jupiter represent the zodiacal sign of Aquarius, because its constellation is very near that of the Eagle. Overall the decoration does not appear to be very suitable for a cardinal, but Ferdinando did not regard himself as a man of the church. He resigned the cardinalate, married, had four children and was portrayed as a military commander in a fine equestrian statue in Florence. 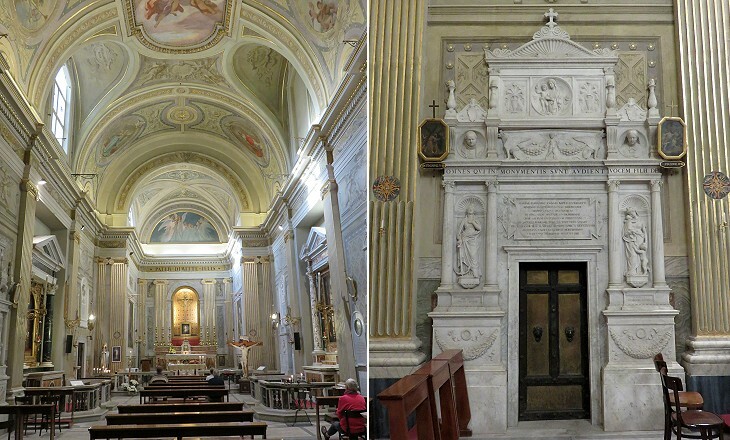 This medieval church was rebuilt in 1731 by Filippo Raguzzini with the exception of the bell tower. 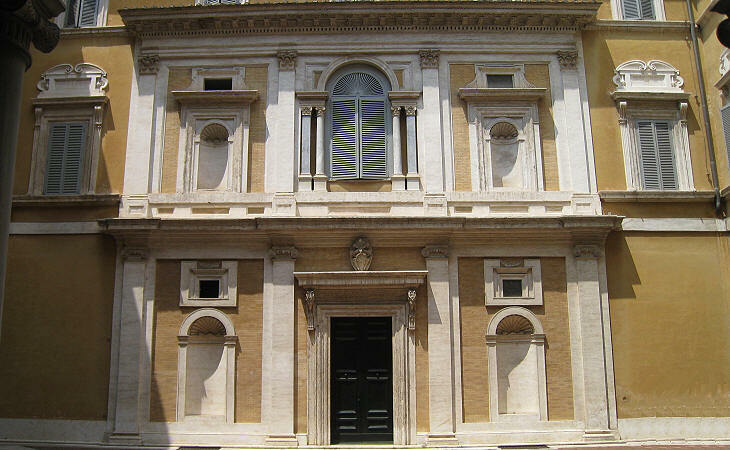 The church was dedicated to St. Cecilia, because according to tradition it had been erected on Cecilia's father's house. In the XVIth century it was given to the guild of the mattress-makers and the name of their patron saint (St. Blaise) was added. You may wish to see a directory of churches belonging to a guild. In the XIXth century the guild was abolished and the church was assigned to a brotherhood. Next plate in Book 6: S. Ivo dei Brittoni. Next step in Day 4 itinerary: Obelisco di Augusto nel Campo Marzio. Next step in your tour of Rione Campo Marzio: S. Ivo de' Brittoni. Questa chiesa è molto antica, mentre si legge, che da s. Zaccaria Papa fu assegnata per ricovero alle monache Basiliane venute dalla Grecia circa l'anno 750. Dal Pont. s. Pio V. fu poi nell'anno 1568. conceduta ai frati Domenicani, i quali amministrano la parrocchia.